Manhattan's New York City Hall is located at 2 Lafayette Street, New York, NY 10007; phone: 212-788-6879. 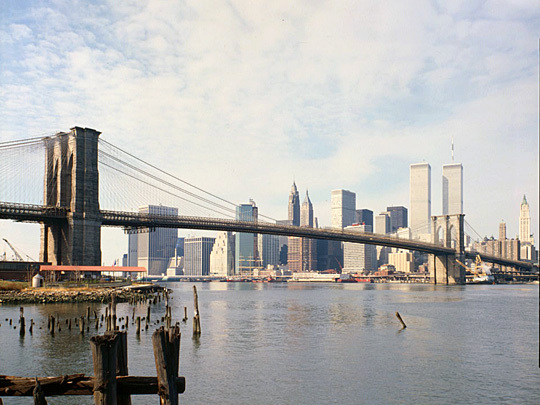 Photo: View of Lower Manhattan and the Brooklyn Bridge, Historic American Engineering Record [HAER NY-18], Jet Lowe, photographer, 1982, memory.loc.gov, accessed February, 2011. The island of Manhattan is co-terminus with the boundaries of New York County. The word Manna-hata, appears in a logbook entry of 1609, by an officer (Robert Juet) serving on Henry Hudson's ship, the Half Moon (Halve Maen). It is believed that the word Manhattan is derived from the Lenni Lenape tongue, meaning "island of many hills." The Lenni Lenape inhabited Manhattan Island, probably as far back as the early 16th century. Europeans were absent until 1624 when the Dutch established "New Netherland" (later New Amsterdam) as a fur trading post. New Amsterdam was incorporated as a City in 1653. Prior to the completion of the Erie Canal, the story of Lower Manhattan was largely that of the whole city. In contrast to Boston, Philadelphia, and other Colonial settlements, New Amsterdam, belonging to the Dutch West India Company, was founded in 1626 mainly for commercial reasons. As time passed, the little trading post became the market place and financial capital of the rapidly expanding colony. Almost from the first, commercial establishments began a ceaseless march northward, encroaching upon steadily retreating residential districts. The Wall Street stockade, built in 1653 by the Dutch at the town's northern limit, was removed by the British in 1699; by 1771 the city, with 22,000 population, extended to Grand Street; and after the Revolution the movement northward reached Greenwich Village, accelerated by the yellow fever epidemics at the turn of the century. Under English rule, following New Amsterdam's surrender in 1664, two great steps toward freedom were taken here. A free press was assured in 1735 as a result of the trial of John Peter Zenger, editor of the New York Weekly Journal, and liberty of worship was firmly established early in the eighteenth century. The history of New York during the Revolution is less notable than that of Boston and other large towns, since the British occupied Manhattan for almost the entire duration of the war. Early in the conflict, however, liberty poles had been erected on the Common (now City Hall Park), and the lead statue of George III in Bowling Green had been melted into bullets for the Colonists' cause. After the Revolution, New York (the city still consisted of the lower part of the island) boasted of being the first capital of the United States of America. Though suffering temporary setbacks, New York, like several other major American cities, grew rapidly in the next fifty years. In 1792 an embryonic stock exchange was modestly inaugurated under a Wall Street tree. The opening of the Erie Canal in 1825 and the expansion of the West began the process which soon made New York the market place and banker of half a continent, and the primary gateway to Europe. By 1830 the population was 202,589; by 1860 the rising tide of immigration, which was to sweep the city in successive waves for another half-century, had helped to raise the total to 813,669. After the Civil War the Erie Canal lost much of its importance, but by this time New York, with its superb harbor formation, had already attracted a tremendous foreign commerce, and it now became also a railroad center, with many of its freight terminals located across the Hudson River. The more spectacular side of nineteenth-century New York history is associated with lower Manhattan. As early as the 1830's Tammany Hall had discovered the advantages to be derived for itself from the vote of the unassimilated immigrant, and City Hall became the pawn of a group of men whose main object was to deplete the public treasury. The infamous operations of the Tweed Ring in the 1860's and early 1870's, and of other early Tammany politicians, belongs to the past of this older part of the city. Following the Civil War, Wall Street, only a few short blocks south of City Hall, began its more ambitious career as financial controller of the nation. The history of Lower Manhattan has, however, another side. In the late nineteenth and early twentieth centuries "Newspaper Row" was situated on Park Row. Here James Gordon Bennett, Joseph Pulitzer, and William Randolph Hearst fought their sensational battles. Lincoln Steffens discoursed on political corruption, and Richard Harding Davis and O. Henry spun their tales O. Henry finding in this exciting, chaotic, sordid section of the city much material for the stories of "Baghdad on the Subway." With increasing rapidity, the residential areas receded northward. About the 1850's aristocratic St. John's Park began to yield to commerce, and the well-to-do were to be found only in the purlieus of Lower Manhattan, around Greenwich Village. By the time the World War was declared, only a small number of the city's more prosperous residents remained below Fourteenth Street, chiefly in mansions around Washington Square and lower Fifth Avenue. Beginning in the 1880's Greenwich Village was occupied by the Irish and Negroes, and later by Italians. At approximately the same time, the Germans and Irish of the Lower East Side were supplanted by Italians, Russians, Poles, and to an even greater extent by East European Jews, who, despite poverty, filth, and overcrowding retained their native gaiety and hope. Today, a change is appearing in the Lower East Side; though it is still a slum area, the old "lung" blocks are slowly giving way before widened avenues and new apartment houses. The settlement there of an increasing number of artists and painters in the 1910's gave Greenwich Village national prominence as an artistic and literary center. Federal Writers' Project, Works Progress Administration, New York City Guide, American Guide Series, The Guilds' Committee or Federal Writers' Publications, Inc., Random House Publishers, New York, 1939.